English cottage gardens are my favourite type of garden they remind me of my childhood, visiting Grandmas smelling the flowers, eating the strawberries, climbing the apple tree to get a birds eye view of the garden. Maybe you too have fond memories of the cottage garden and you would like to recreate the look. This chapter will help you do just that. Cottage gardens are not expensive to recreate. The cottager was not rich after all. Most cottage gardens in England grew organically, each year more plants would be added either by nature self sowing or from a neighbour passing along a cutting. The flowers for most cottage gardens came from the head gardener on the village estate. When his plants needed dividing he would give then to the cottager if he had no need for them. The cottager would then next year do the same and pass them to his neighbour. It is this random planting that creates the cheery jumble of colourful flowers that is so quintessential of English cottage gardens. Cottage gardens are one of the most organic and sustainable forms of gardens. Fill your cottage garden with all kinds of cottage flowers, not just one kind. This is a natural way to keep down bugs and pests which are attracted to a larger area of their favourite plants. Above all there should be no gaps in a cottage garden. Fill in any spaces with various cottage plants, this is not just for show. The dense planting will create a canopy restricting light which will keep down weeds and keep the plants fresh on hot summer days. Traditionally cottage gardens did not have lawns, so if mowing the grass is a thorn in your side, consider creating an cottage garden and never have to mow your lawn again. All cottage gardens were created out of necessity or love or both and all have been designed to please the cottager who lived there. Cottage gardens are a reflexion of the cottagers personality that is why each one is unique. 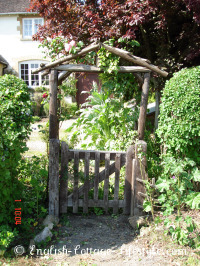 There is no formal garden design but there is a cottage garden tradition and when it comes to creating an authentic English cottage garden a little information can go a long way. This section is dedicated to England's cottage gardens. In here you will find information about the history, types of plants and features of England's traditional cottage gardens.